This morning I enjoyed my last shower for an indefinite period. We are in Eilat at the southern tip where Israel, Egypt and Jordan meet and where the trail begins. We arrived in Tel Aviv inadvertently on Shabbat (which is from sundown Friday to sundown Saturday) and all public transportation had ceased. There was not a plane, train, bus or donkey to be had in the state of Israel. Taxi was the only mode of transport and we paid a steep premium. Our hostel on the Tel Aviv beach had funky plumbing and a communal bathroom but a gorgeous view of the surf and suited us just fine. We wandered to a nearby takeout for a delicious “salty cheese and olive” bannock turnover for dinner for 16 shekels (approximately $7.00) and felt completely safe. While waiting last night for our flight to Eilat we met a lady named Joy and her 18-month-old baby. 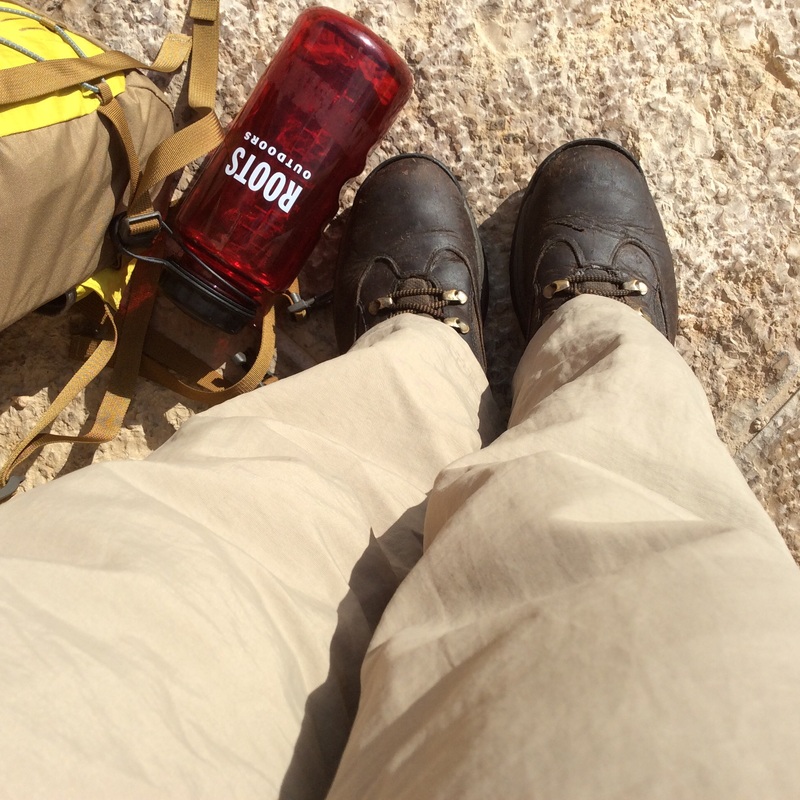 She was from Montreal and was on her way to Petra in Jordan to meet her Jordanian husband. Our original plan was to see Petra before starting the trail but because the cost was prohibitive, we nixed it. So when she invited us to drive there with her and eat with her family in their cave we jumped on it. But alas, we were turned away at the Jordanian border because of a recently implemented advance visa requirement. So it was another taxi to the shelter hostel in Eilat. 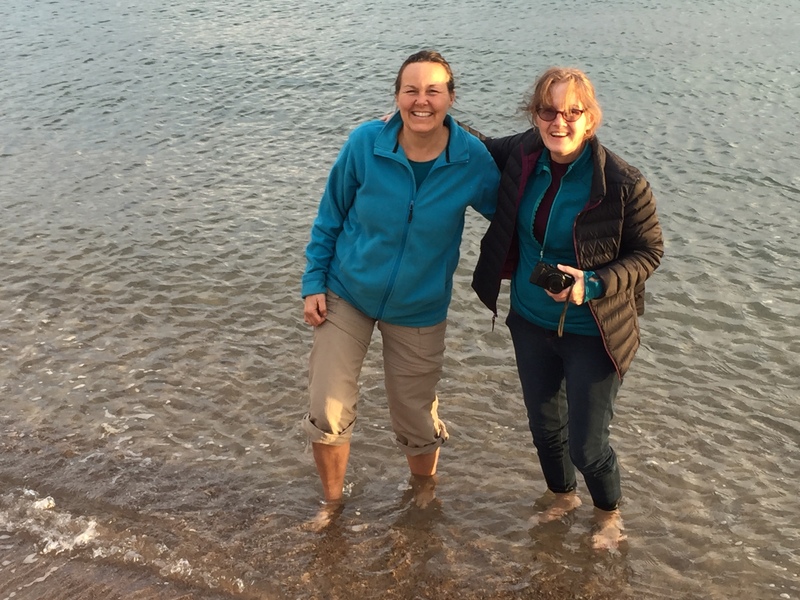 We got stove fuel today, sorted our packs and celebrated the begin of the trek by dipping our feet in the Red Sea. Tomorrow we start to walk. We are anxious to be on our way even though the weight of our packs is daunting. The weather has been cool, windy and rainy but it’s time to limbo (not “Limpo”) and we are ready. (I just hope the bar is not set to low)! I sit here at gate thirty in the far reaches of the Toronto airport. I am on the floor with my iPad plugged in to the support pole so I don’t use precious battery power even though, fortunately, my new solar charger arrived last night at the ninth hour. Other last minute stuff items were sun screen, sun glasses, and more pharmaceuticals. I am also wearing different clothes than planned on account of my recent eating habits. My thoughts are with Jim and his family as they see to the cremation of his father today. The emotions that accompany and surround a significant loss combined with suddenly being on my way have left me feeling unsettled (not to mention the bizarre occurrence of seeing a large rat scurry across my kitchen floor this morning. I had no time to deal with it so I left a note for Colin). And there appears to be a slight ruckus nearby…loud, angry voices in a language I don’t understand. People are standing and looking but I’m staying down. Shortly after my last entry the ruckus died away, Jim called and filled me in and overall, I felt more settled. Then as people were boarding I was called behind the security counter where I was questioned for 30 minutes about my purpose in Israel, where I lived, what I did, how long, etc. by three different people. They were polite but intense. It was reassuring that safety is taken so seriously but even knowing it was random selection of a solo traveller, it was a little disconcerting being the object of the questioning. I was the last person to board the plane minutes before take off. The 11 hour flight was uneventful and now I rest and write while I wait for Jennifer to arrive in a few hours. It cost me 348 Shekels ($140.00) to get an Israeli SIM card and a month with 1 Gigi of data. Reggie Doyle was a kind and unassuming man who liked to be in the background. His clear, blue eyes shone with intelligence and danced with humour at the antics of his grandchildren. Sometimes he would get giggling at some little thing that the kids would say or do and it was impossible not to start laughing yourself. His wry sense of humour was infectious. My father-in-law loved his family and he loved his animals. Every morning he fed his animals before he fed himself and in years gone by he had some of the biggest goats this land has ever seen. He never hesitated to help family, friends, neighbours or animals in need. In fact he was locally known as the unofficial vet. Whenever anyone had a problem with their animals it was often Reggie they called, and chances are, he knew what to do. He had a saying that if a 2 cc, s were good then 4 cc’s were twice as good. Reggie was a hard worker and was always busy. For most of his career he worked as a high hoe operator and his skill with the big machines were legendary. Many of the buildings and sites in Brockville and Kingston were excavated by Reggie. Also legendary was his love of ketchup and Dairy Queen. No meal was complete without ketchup and coming home from work in Kingston, a stop at Dairy Queen was customary. They would have his order ready and waiting for him. Reggie met Sheila when they were young teenagers and they started their family early. They moved from Richmond, Quebec in 1971 and raised their family in Lyn near Brockville. Reggie developed an extremely rare condition. He passed away at home early Saturday morning with Sheila, his wife of 53 years by his side. He was much loved and will be deeply missed as a friend, father, father-in-law, grandfather, brother, uncle, cousin, and husband. In the end, Reggie and his condition was the talk of the medical community and I think it tickled him to be medically famous. Rest in peace Reggie. We will all miss you.